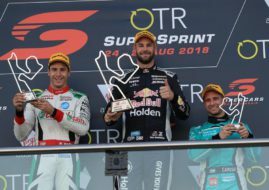 Shane van Gisbergen (Red Bull Racing Australia) wins the Red Rooster Sydney SuperSprint at Sydney Motorsport Park, the 18th round of the V8 Supercars Championship. The Kiwi in the #97 Holden holds off his teammate Jamie Whincup and crossed the finish line just 0.246 seconds ahead of him. Whincup was chasing his 100th V8SC victory but he has to wait for another try in tomorrows’ race. Van Gisbergen started the 31-lap race on the 3.9-km long circuit from the front row, next to the pole-sitter Chaz Mostert while Whincup was in the third starting position. On the opening lap, both Red Bull drivers overtook Mostert, who later lost one more place after a great move of James Courtney on Lap 4. After the obligatory pit stops were over, Van Gisbergen remained in front while Whincup came out behind Scott McLaughlin and Craig Lowndes but he resumed his runner-up position after one lap. Until the end of the race, we saw the intense chase between two teammates but VanGisbergen succeed to take his fifth win of the season. Behind their back, there were few position changes in the fight for the podium. James Courtney took the final podium sot, ahead of Chaz Mostert and Scott McLaughlin. Craig Lowndes, Tim Slade, Garth Tander, Rick Kelly and Fabian Coulthard completed the top 10. After 18 races, Jamie Whincup is still a championship leader, with 98 points more than Van Gisbergen. The defending champion Mark Winterbottom and Craig Lowndes are 186 points down.